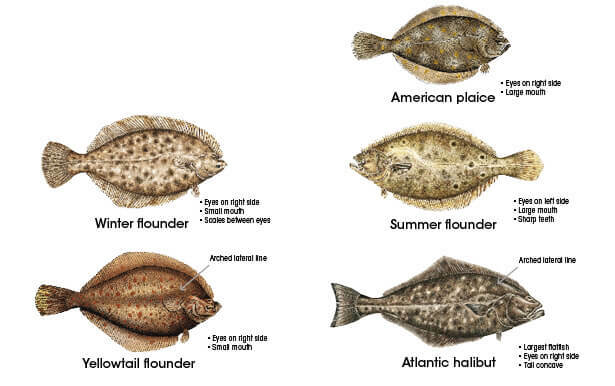 A few features help distinguish the flounder caught recreationally along New Hampshire’s coast that have size regulations: Orientation of the eyes (right- or left-eyed); mouth size; and shape of the lateral line or tail. Recreational saltwater anglers in N.H. most commonly catch winter flounder, followed by yellowtail, summer flounder and American plaice. While not often caught, Atlantic halibut are the largest flounder found in the Gulf of Maine. A variety of herring frequent N.H. coastal and estuarine waters and can be confusing to identify. River herring (alewife and blueback herring) and American shad are generally seen during spring spawning runs. 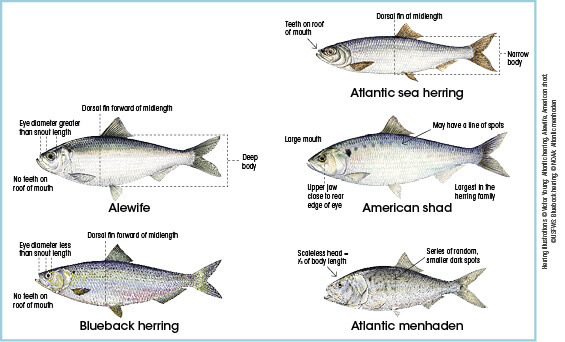 Menhaden and Atlantic herring may appear in our estuaries during coastal migration in the summer or early fall.